The topic of zero waste has been on my mind - and at the request of a friend / reader - I've decided to share. 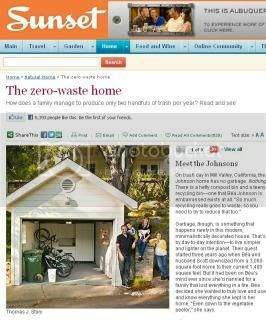 I recently read the Sunset Magazine article about the zero-waste home in California. And while I think this is pretty extreme, it has highlighted some simple things I can do to cut waste at our house. I've already read "Gorgeously Green: 8 Simple Steps to an Earth-Friendly Life " and I have Sophie Uliano's second book "Do It Gorgeously " on my list of books to get. And both of these books helped with brands and companies that are eco-friendly - but the problem tends to be the price tag on such items. One thing I've already started to do: Go to the Farmer's Market under the freeway here in Sacramento every Sunday morning. I bring my own bags and even my own produce bags so I don't have to use any of the plastic bags. These Flip and Tumble Reusable Produce Bags are only $10-$11 on Amazon for 5 bags and they are great at keeping fruits and veggies fresh. Totally worth the purchase if you are interested. The Sunday morning Farmer's Market here in Sacramento is amazing. If you plan it out you can get everything you need for the week - which means you are only buying local. Something I really support. I like it better then those CSA boxes because you choose what you want - plus they sell, fish and meat and oysters - even milk, orange juice, cheese and butter. I'd love to start getting beer and wine in refillable containers, like the growlers at Pyramid. If I find a local winery I like that does that - or takes back the bottles... that would be awesome too. Anyways, the point is that little things I am willing to do - but if its difficult or not fun - then maybe not. And one of the things I really don't agree with is the getting rid of knick knacks, etc. I'm a huge antique fan and think its got to be better to reuse - then buy new right? I guess the point is to love what you have and don't buy something just to be purchasing. I'll keep sharing things I'm doing to cut back on my waste. And I'm open to suggestions! I'm also hoping to post soon about my finds at the farmers market and do a little comparison to the grocery stores. So look for that post soon!